Okay, so maybe that sounds ridiculously simple, but I have noticed over the past couple of months that when people are trying to share a review, they share a link to their book. Which review on that page did you want people to see? Hopefully there aren’t any one- or two-star reviews on there. You realize this means that the folks you’re trying to impress aren’t seeing what you’re trying to impress them with, right? Kind of defeats the purpose, doesn’t it? Unfortunately, not all retailers make it simple for folks to share a link that goes just to a specific review. So far, I’ve found that you can share individual reviews from Amazon, Goodreads, Shelfari, and LibraryThing. I guess the latter three make a lot of sense since they are, in fact, review sites. I double- and triple-checked – unfortunately, Barnes & Noble, Kobo, iTunes, and Smashwords do not have a way to share individual reviews. So, how does one go about sharing individual reviews for the sites which allow it? Most of them make it pretty easy. 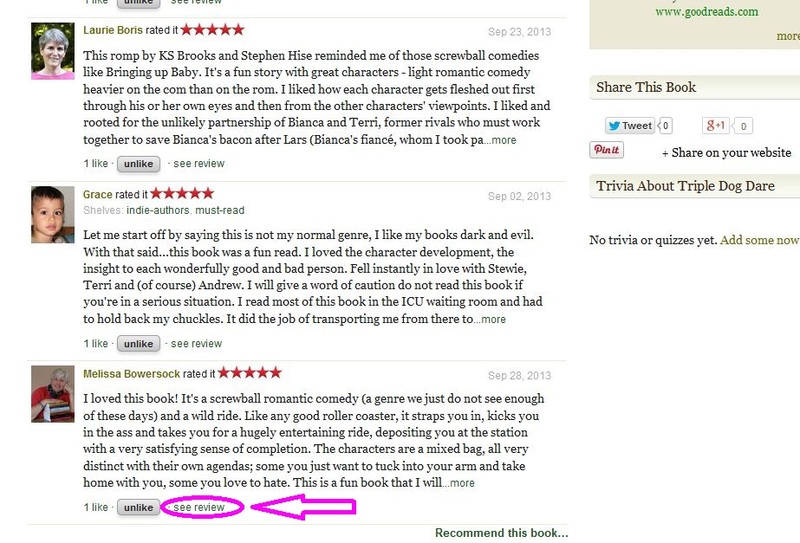 Goodreads: Well, if you can actually find the review, then you’re doing well. I know there are more reviews on certain books, but I can’t even begin to figure out where those are. But no worries – once you find the one you want, it’s simple. Go to the review you want to share and click see review. The next screen that opens contains only that review. 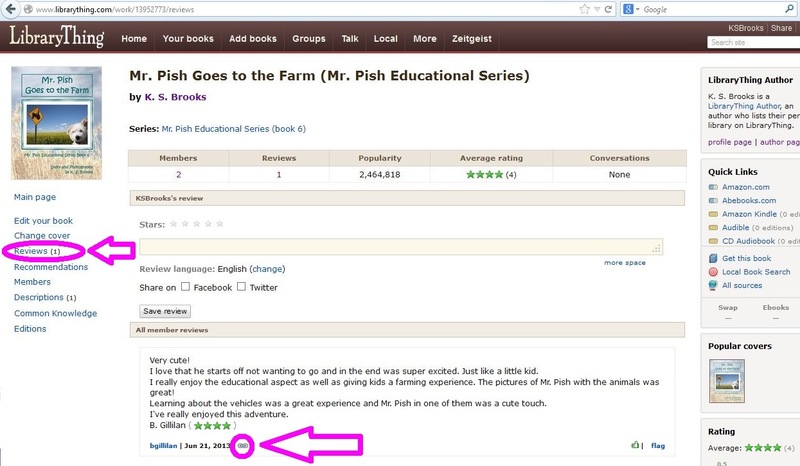 You can copy the URL or you can use the share buttons on the bottom right of the screen capture to share your awesome review. Shelfari: Go to the book and scroll down to the reviews. Click on permalink. That will open up another screen for you. From there, just select the URL or use the share buttons they have over to the right. 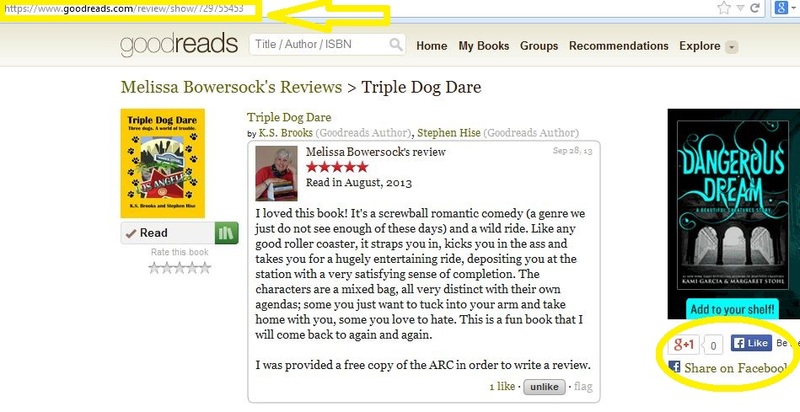 LibraryThing: Find the book you want and either scroll down to reviews or click on reviews in the left sidebar. Once you’re at the review, you’ll find a little chain “link” – click on that and a page containing only the review will open. Again, just grab the URL at the top of the page and you’re good to go. Now, personally, I wouldn’t be inclined to use links to these sites unless these reviews did not appear on Amazon.com for some reason. Honestly, it’s a lot easier for people who click through to then go ahead and purchase this book if you give them the Amazon review link. And doing that is just as easy as the other sites. 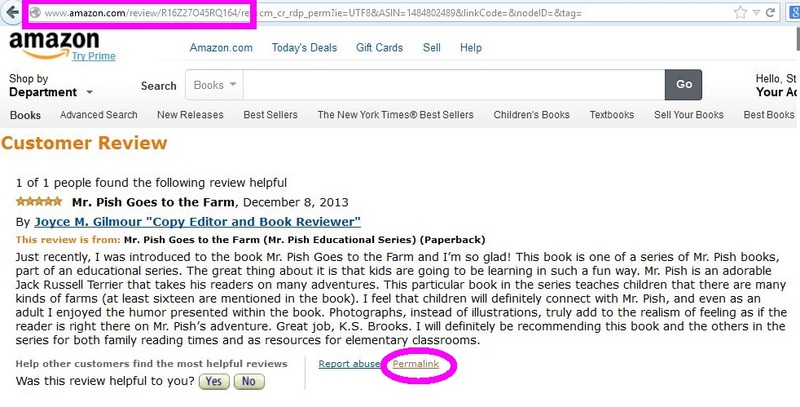 Amazon.com: Go to your book’s page and scroll down to the reviews. Find the review you want. Click on the review’s title and it will bring you to a page dedicated to that review. Just grab the url – you only need the information before that last slash, and that’s all you need! If you’re feeling uncertain, you can click the Permalink at the bottom of the review, but it’s really not necessary. It’s just going to take you to the same page. So now you can share an awesome review without making people search or scroll through the page to find it. You may want to brush up on this before Saturday. Just sayin’. Kat, thanks for some useful information. Happy holidays. KS, very informative. I had the time to discover it all but it will be a great help for authors who are venturing into all those network soon. Allow me to profit from your post to wish everyone at IU, staff, lurkers, posters, and the gang, a joyful holiday season and may all our dreams come true in 2014. Good info, KS. Thanks. Happy Holidays to all IUs. Thanks for this, Kat. I couldn’t figure out how to do it before. Happy Festive Season to everyone at Indies Unlimited. Glad to help, Mary! Please feel free to let me know if there are any other tutorials you need. Thank you for the holiday wishes – same to you and yours! You’re always there with the helpful info, Kat, just one of the reasons IU is where they are today. Happy holidays to you and yours from me and mine. Great helpful information, Kat. Thank you. Thanks for this important and amazing info. Happy New Year. Thank you for posting this. Good reminders and good tips! You’re very welcome. Thank you for stopping by and for leaving a comment.